This month’s Sinister Reads features new novels from Cameron Trust (The Tunnel Runner) as well as yours truly 🙂 Catch up on all the latest from Australian Horror in Sinister Reads. Hey there creepers, creepies, and creepsters! Welcome to another edition of Sinister Reads. Another short one with a powerful punch! Check out the two awesome releases this month. There is no rest for the wicked, and Cameron Trost is soooo wicked… wickedly amazing! The Tunnel Runner will get you thinking and freaking – we love that! 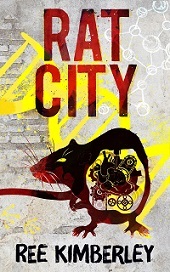 Ree Kimberley has gifted us something special in Rat City – a horror novel for young adults. If I had kids, they would read nothing else. I don’t have kids… it’s safer that way….